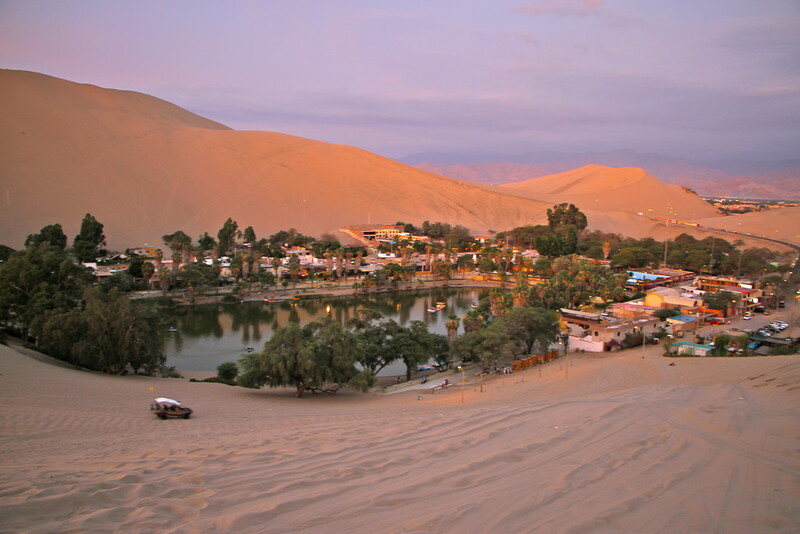 After a great couple of weeks learning Spanish and cooking classes in Arequipa, we’d heard about a small oasis called Huacachina, located in the blisteringly hot Peruvian desert and surrounded by huge sand dunes! We arrived after a long bus journey, and planned to do two things: relax, and attempt some sand dune surfing! 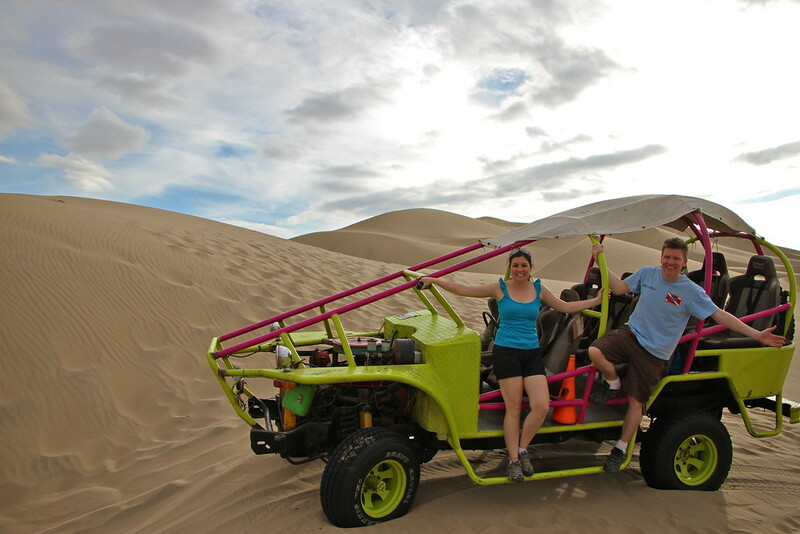 After our experience of traversing the sand dunes of Mui Ne, Vietnam, we were ready to take advantage of the miles of huge, rolling sand dunes surrounding Huacachina! 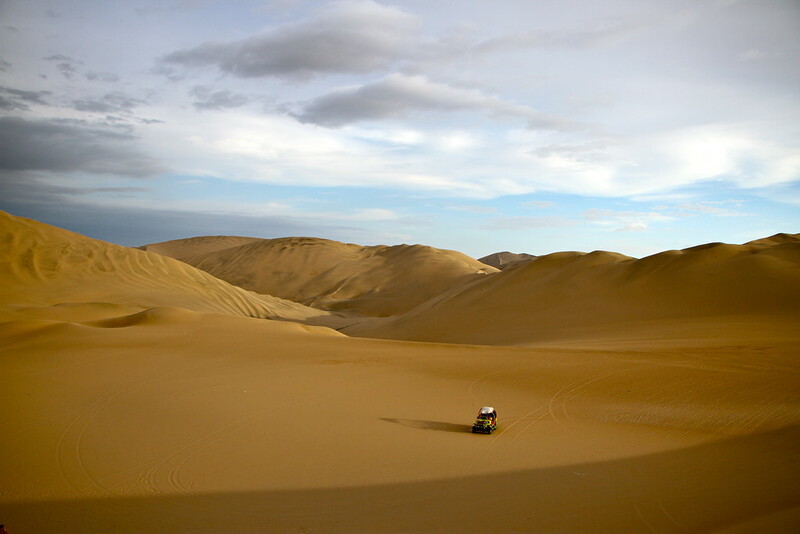 We’d heard you could go on a dune buggying ride into the desert, and then sand board down the dunes on makeshift boards. We signed up, despite no real experience in snow boarding (or surfing) and waited for our driver to pick us up. We knew we were in for a manic afternoon when the two jeep buggies pulled up, adorned with multiple roll bars and harness like seatbelts. It looked like it might get a little rough – we didn’t know the half of it. 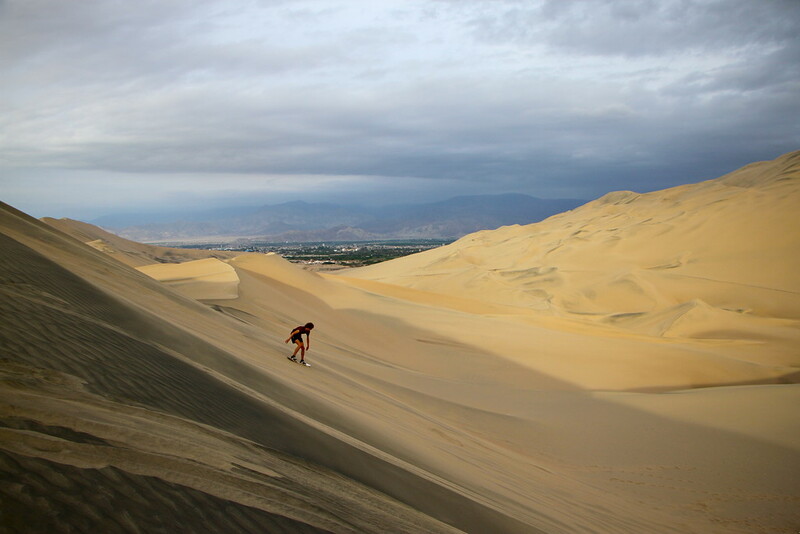 What followed was a chaotic, adrenaline fuelled ride across the sand dunes of Huacachina! Eyeing up the two jeeps, we quickly put our travelling heads into action, and did what we normally do when faced with a choice of driver: pick the more experienced (read: older) driver. It’s worked on most of our travels, why stop now? Jumping into his jeep and buckling up, the journey started innocuously enough. Driving through the street (yes, street) of Huacahina towards the sand dunes. Then the moment when we thought, what have we signed ourselves up for? Our driver turned around (whilst still driving) gave a cheeky smile and shouted ‘vamos’! 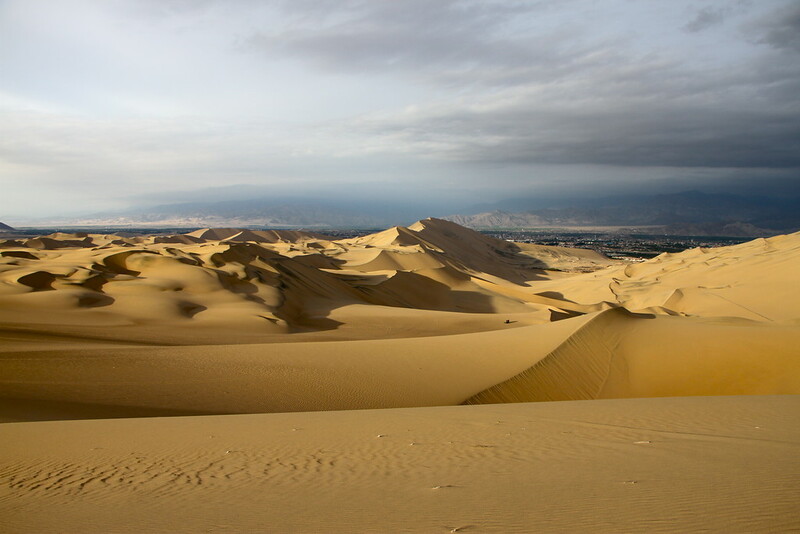 Before accelerating onto the sand dunes and upwards toward the summit of a huge dune! 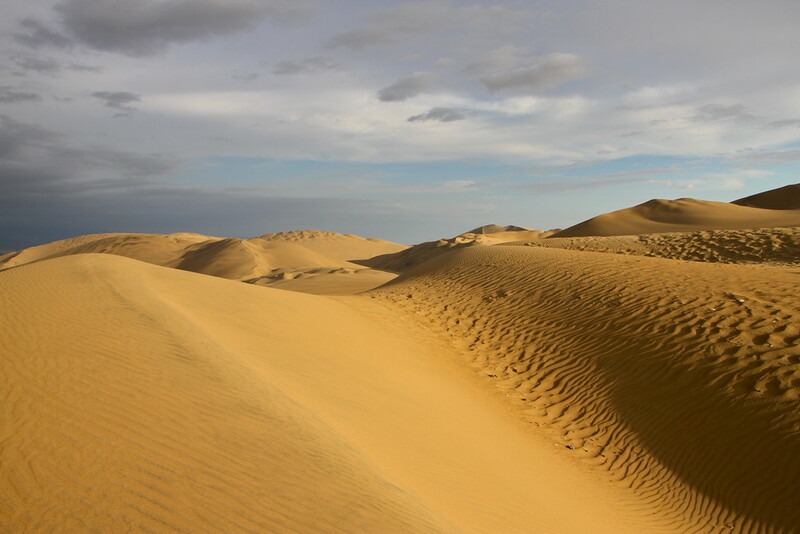 Imagine being on a rollercoaster, but instead of being attached to rails you are attached to sand. Oh and it seems even the driver doesn’t seem to know where he’s going until the last minute, that was pretty much how we felt. Reaching the top of the huge dune, the jeep paused slightly. Our driver turned to look at us all, and, with a slightly manic glint in his eye, revved up the engine and accelerated over the top of the dune and downwards! Now we understood the need for the roll bars! Fancy seeing a bit of the action? Of course you do. Very glad you survived this fairly unscathed. Last year our friend had an almost fatal accident doing this (lying down) in Peru and was flown back to Scotland weeks later with multiple broken bones, bleeding on the brain etc. His board careered off course and he landed head first in rock. Fortunately he is well on the way to recovery. Sounds absolutely awful Sheila, despite being seasoned travellers we still signed up without fully appreciating how dangerous it could be. It was only once we were out there that we thought better of being too confident, with the lying down seemingly the safer option – obviously it still has its dangers! Hope your friend makes a full recovery, and thanks for sharing this on our article. Great article! Do you remember which company you used for the tour and how much did it cost you? Hi Rita! I’m sorry we dont remember, but wherever you’re staying they’ll be able to arrange it for you I’m sure!